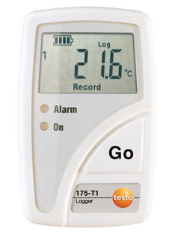 The Testo 175-T1 temperature data logger, ideal for accompanying goods, guarantees uninterrupted documentation of the complete refrigeration chain. The Testo 575 fast printer provides proof that the goods have adhered to the specified temperature. All of the data which have been collected by the testo 580 data collector can be sent to your PC for analysis, if required.